While I was at the Pin Oak Charity Horse Show covering the jousting demonstration that was part of the event's Opening 'Knight' ceremonies, I became re-acquainted with several friends who are breeders and trainers of Andalusian and Lusitano horses, including Nicole Hill of Suspension Sporthorses. I introduced Nicole to my Andalusian/Lusitano gelding Shadowfax, and she asked about the use of Spanish and Portuguese horses in jousting. 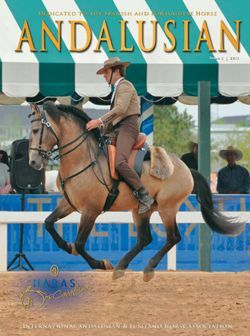 One thing led to another, and I ended up writing an article about "The Iberian Horse in Competitive Jousting" to be included in both the print and online versions of the most recent issue of Andalusian magazine which is put out by the International Andalusian and Lusitano Horse Association(IALHA). 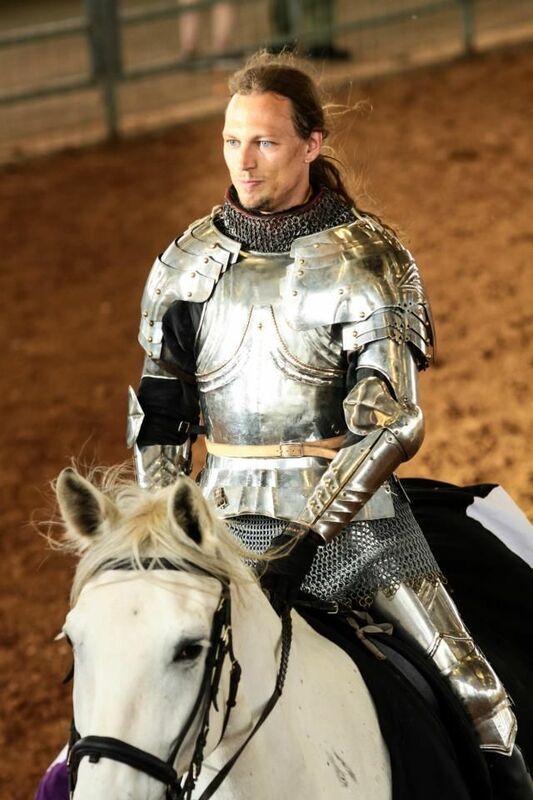 Since I was writing for an audience that generally had little to no experience with the sport of contemporary competitive jousting, parts of the article are extremely simplified. Jousting is a very complicated sport. The history of the joust could and has filled several books, and the modern sport is just as filled with variation and controversy as historical jousting. It would be impossible for anyone to give a comprehensive overview of the sport in a magazine article. So what I tried to do was give a good BASIC introduction to the sport with an emphasis on the use of the Andalusian, the Lusitano and their crosses as jousting horses. I am not a scholar of the history of jousting, nor have I ever jousted. However, I have been involved in jousting practices, clinics, demonstrations and tournaments of various sorts over the past six years, and I have been writing and editing "The Jousting Life" for a year and a half. I may not be the best person to write a magazine article about competitive jousting(I can think of several people who would be more qualified off the top of my head), but I was the one the magazine asked, so I took it upon myself to write the article. I did request and receive help in writing this article from a number of jousting scholars and experienced jousters, including(in no particular order) Steve Hemphill, Arne Koets, Wouter Nicolai, Hanne Prøis-Røhjell, Douglas Wagner, Andreas Wenzel, Alix van Zijl, Ken Mondschein, Bertus Brokamp, Rod Walker, Virginia Hankins, Luke Binks and probably some others that I've left out because I'm forgetful, not because their contributions weren't valuable. Anything I got right in the article is probably due to one of the aforementioned people. Anything I got wrong is completely my own fault. I also received help from a number of photographers who graciously allowed the magazine to use their photographs to illustrate the article, including(in no particular order)Vera Bos, Hanno van Harten, Rozemarijn Keuning, AzulOx photography, Oliver Dunsch, Virginia Hankins/Chanty, "The Grand Tournament of Sankt Wendel" website and The City of Sankt Wendel. Other photographers donated pictures that were not chosen to be used in the article, but they are equally deserving of thanks, including(in no particular order)Franziska Schatek, Gerlinde Viveen, Nigel Wallace-Iles, Pat Huey and Katrina Dutchover Gitlin. If I left anyone out, I apologize. Unfortunately, due to an error, none of the photographers were properly credited for the pictures that were used by the magazine. The IALHA president has apologized and said that they will print the names of the photographers whose pictures were used in the article in the next issue of Andalusian magazine. I would especially like to thank my husband, Ryan, who has given me unconditional love and support over the years. 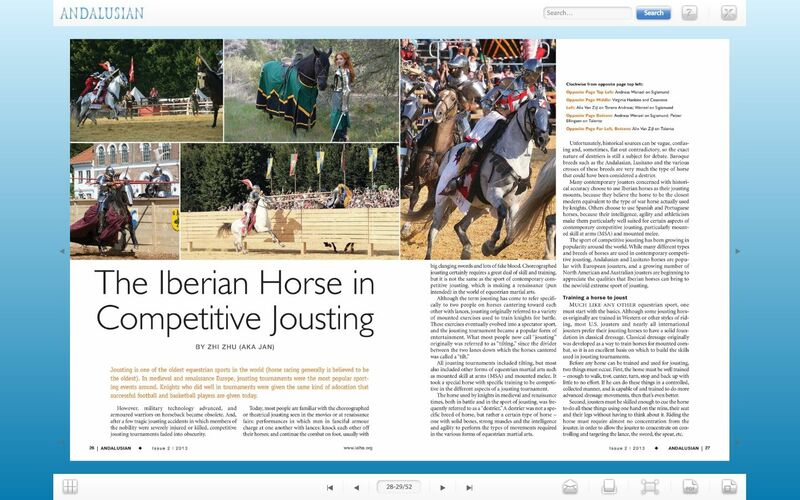 Without him, I would never have had the courage to create and continue to produce "The Jousting Life" which led directly to being asked to write the article for Andalusian Magazine. He means the world to me, and I probably don't thank him enough for all he does for me. Ryan Saathoff riding Shadowfax at "Lysts on the Lake 2012"